The team that had been known as the Houston Oilers for 37 years began a new chapter as a Tennessee-based franchise on August 31, 1997. Coached by Jeff Fisher, the Oilers were coming off of an 8-8 record in ’96. While they faded badly after getting off to a 5-2 start, they were a rebuilding team that also showed improvement and had young talent at key positions. Mobile third-year QB Steve McNair was heading into his first season as the starter, with veteran Chris Chandler having been dealt away during the offseason. RB Eddie George (pictured at right) rushed for 1368 yards and received Rookie of the Year recognition, and he was expected to carry even more of a load in his second year. The team they were facing in the opening week was the Raiders, who had returned to Oakland two years before after a 13-season sojourn in Los Angeles. 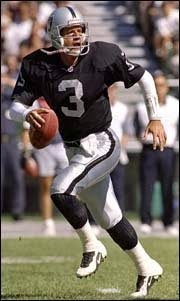 The Raiders were coming off a 7-9 tally in 1996 and had made changes at head coach, where Joe Bugel was replacing Mike White, and quarterback, with the talented but immature Jeff George taking over from Jeff Hostetler. They also had a fine runner in Napoleon Kaufman and a reliable receiver in WR Tim Brown. However, the defense was full of question marks. There was a disappointing crowd of 30,171 in attendance at the 62,300-seat Liberty Bowl in Memphis, which was to serve as a first-year home for the Nashville-bound club, on a damp and hazy day, and many of them were there to support the visiting Raiders. The teams exchanged punts to start the game. Commencing their second possession from their own nine yard line, the Raiders suffered a turnover when Napoleon Kaufman fumbled after catching a pass from Jeff George and the LB Lonnie Marts recovered for the Oilers at the 20. Four plays later, Al Del Greco kicked a 30-yard field goal to put the home team in front by 3-0. Oakland responded by moving into Tennessee territory when George threw to TE Rickey Dudley for a 26-yard gain. Two runs by Kaufman gained nine yards but a third down option pass was incomplete and Cole Ford’s 46-yard field goal attempt was wide to the left. The Oilers came back with a five-play, 63-yard drive that featured a pass from Steve McNair to WR Willie Davis that picked up 21 yards to the Oakland 38. Another pass by McNair resulted in a 48-yard touchdown completion to WR Chris Sanders. Del Greco added the extra point and Tennessee took a 10-0 lead into the second quarter. Following a punt by the Raiders, Tennessee’s next series ended with McNair being intercepted by SS James Trapp to give Oakland good starting field position at the Oilers’ 49. However, after advancing to the 37, the visitors lost ground and once again had to punt. Oakland again got the ball back on a turnover, this time a fumble by WR Derrick Mason, and again failed to capitalize. 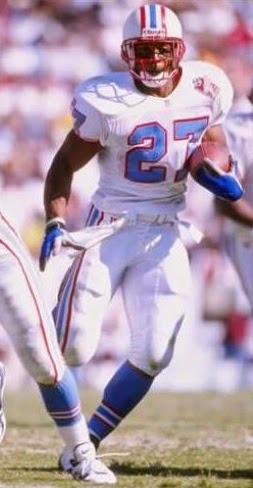 The half ended with the Oilers ahead by ten, and Eddie George had already gained 95 yards rushing. Tennessee started off the third quarter with a 14-play series that covered 47 yards, converting two third downs along the way, and finishing up with Del Greco kicking a 37-yard field goal. But down by 13 points, the Raiders struck quickly on their next possession. On the second play, George completed a pass to Tim Brown for a 59-yard touchdown and, with Ford’s successful conversion, the tally stood at 13-7. Following a short series by the Oilers that resulted in a punt, Oakland put together another scoring drive that stretched into the final period and was helped along by a pass interference penalty in a third-and-nine situation. George completed passes to Brown for 19 and 13 yards along the way and capped the nine-play, 75-yard possession with another throw to Brown for a 27-yard TD. With Ford’s extra point, the Raiders were in the lead by 14-13. The teams traded punts before Tennessee put together a 90-yard series that took 13 plays. The last six were all runs by George, the final carry good for a 29-yard touchdown. George then successfully ran for a two-point conversion and, with just over two minutes remaining in regulation, the Oilers were back in the lead at 21-14. The Raiders started off from their own 47 following a 34-yard kickoff return by RB Tim Hall. George completed four straight passes, the longest covering 18 yards to WR Olanda Truitt, to get to the Tennessee 16. The next three throws fell incomplete and, while RB Derrick Fenner ran for seven yards, two sacks had the Raiders back at the 16 and facing fourth-and-goal and the clock down to 28 seconds. However, George tossed a bullet to Brown between two defenders for a TD and, with Ford adding the all-important extra point, the game was tied at 21-21 and went into overtime. Tennessee had the first possession in the extra period but went three-and-out and had to punt. The Raiders were no more successful and punted in turn. Starting at their 35, the Oilers got two pass completions from McNair to TE Frank Wycheck, one for 21 yards and then for 10 to reach the Oakland 32. McNair ran the ball himself around end for 11 more yards and, after George went up the middle for six yards, Del Greco came in to kick the decisive field goal from 33 yards. The Oilers came away the winner in their first game as a Tennessee team by the final score of 24-21. Tennessee had more total yards (419 to 332), with 255 yards of that total coming on the ground, and also had the edge in first downs (20 to 17). The Oilers also turned the ball over twice, to one turnover suffered by Oakland. Each team recorded three sacks. Eddie George rushed for 216 yards on 35 carries that included a touchdown – it was the second-highest opening-game rushing total in NFL history at the time. Steve McNair completed 13 of 25 passes for 182 yards and had one TD as well as one interception. He further contributed 23 yards on the ground. RB Ronnie Harmon caught 5 passes for 50 yards and Chris Sanders gained 51 yards on his two receptions that included a touchdown. Al Del Greco was successful on all three of his field goal attempts, including the game-winner in overtime. For the Raiders, Jeff George (pictured at left) was successful on 21 of 37 throws for 298 yards and three TDs with none intercepted. Tim Brown caught 8 of those passes for 158 yards and three scores. Napoleon Kauffman ran for just 32 yards on 12 carries. The Week 1 win was followed by four consecutive losses before the Oilers won six of their next eight contests and finished up with another 8-8 season that placed them third in the AFC Central. Practicing in Nashville, 210 miles away, while playing before sparse crowds in Memphis hurt, and the team moved to Nashville’s Vanderbilt Stadium in 1998 before finally coming to rest in a newly-constructed stadium in ’99 – and with a new name, the Titans, as well. The Raiders dropped to 4-12, tying with San Diego at the bottom of the AFC West. While Jeff George passed for a league-leading 3917 yards and topped the AFC with 29 TD passes and Tim Brown caught 104 passes for 1408 yards, they could not make up for poor defensive play. Eddie George went on to rush for 1399 yards on 357 carries (3.9 avg.) and was chosen to the Pro Bowl for the first of four straight seasons. The 216-yard performance against Oakland remained his career high.